A Inteno DG200A router contains a basic firewall to help protect your home network. A Firewall blocks incoming connections by nature. Sometimes you need to unblock some of these connections so you can run a game or application. This is called opening a port or port forwarding. Port forwarding is literally forwarding a port from the Internet to your home network. On the computer or device that you are forwarding ports to, you will need to set up a static IP address. Go ahead and log in to your Inteno DG200A router. 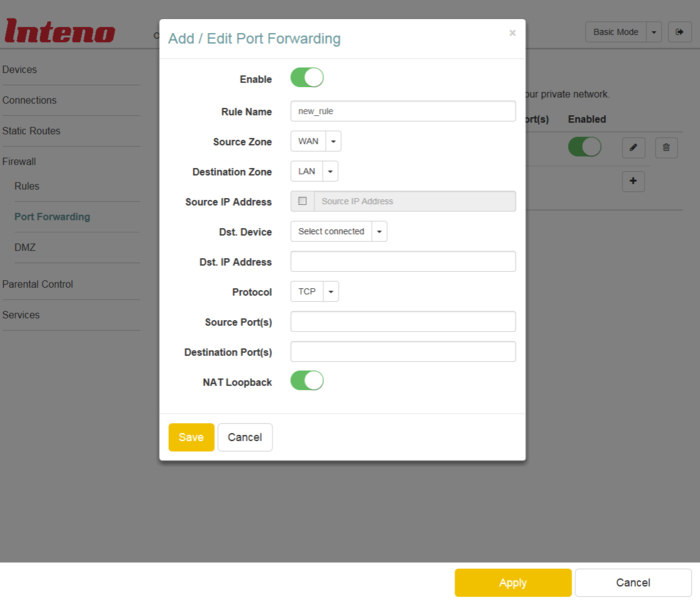 Find the Port Forwarding section in your Inteno DG200A router. Find the Firewall tab located near the left of the screen and click on it. Find the Port Forwarding link located near the left of the screen and click it. Opening ports in a router can be a difficult process the first few times. Don't get discouraged! We will walk you through all the steps to open a port in the Inteno DG200A router. In order to ensure that your ports remain open in your device even after it reboots, it is important to set up a static IP address in your device. 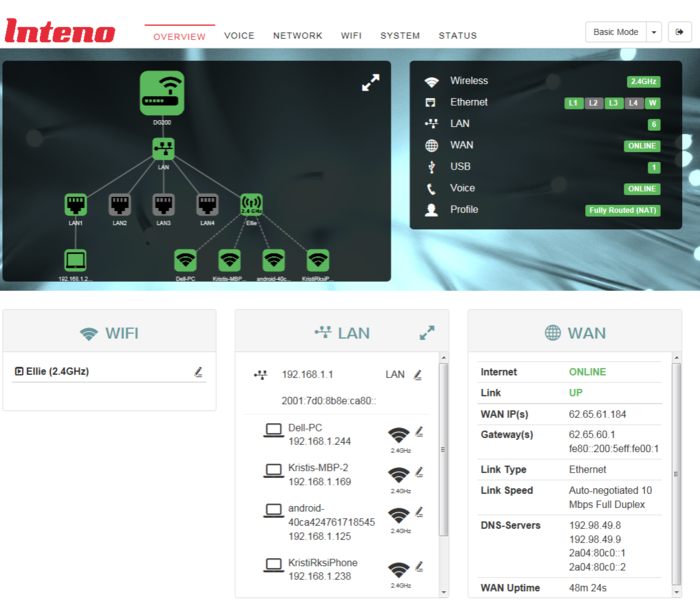 The Inteno DG200A router uses a web interface to display router settings. In order to login to the Inteno DG200A router you need to use a web browser. Once you have finished entering your router's IP address into the address bar, click the enter button on your keyboard. A box similar to the one below should appear. To login, enter the username and password for the Inteno DG200As. Important Note: If you have changed them in the past, you need to enter in those values. Once you enter your username and password, click the Login button. 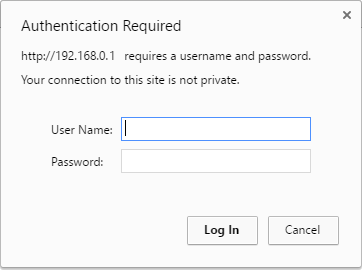 If the username or password did not work check out our Default Inteno Router Passwords page. If you are unable to log in even after trying the above list of passwords you may need to consider a reset for your router. Our guide How to Reset a Router can help you with that. After resetting the Inteno DG200A router your username and password will be reverted back to factory defaults. You should be on the home page of your Inteno DG200A router once you have successfully logged in. Find the Port Forwarding section of your router. Find the Network tab located near the top of the screen and click on it. Click the Port Forwarding link, which can be found at the left of the screen. You should now be on a page called Port Forwarding. Opening a port to a specific device may solve problems that you are having on your network. Make sure that it is necessary though, before opening a port, because you are effectively creating a pinhole in the firewall portion of your router that could lead to malicious traffic on your network. The risk is exceedingly low though, so don't let this warning stop you from making this change if you need it. Create a name for this forward and type it into the Name box. Since the name does not have an effect on the functionality of the forward, choose a name that will help you remember why the forward was created. If you are forwarding a single port number, enter it into the Public Ports box. If you are forwarding a range of ports, enter the lowest number of that range into the Public Ports box followed by a hyphen followed by the largest number. For example a range of port numbers might look like this: 1000-2000. In the Private Ports box, enter the same values that you entered into the Public Ports box. When you are completely finished, click the Apply button at the bottom of the page to apply these changes. Finally, I strongly recommend testing to see if you forwarded the Inteno DG200A ports correctly. To do this you can use our Network Utilities tool, which includes a free Open Port Checker. Open Port Checker is the only online port checking tool that has Guaranteed Results. We have software that does all of this and more called Network Utilities. Learn how to Setup your router.